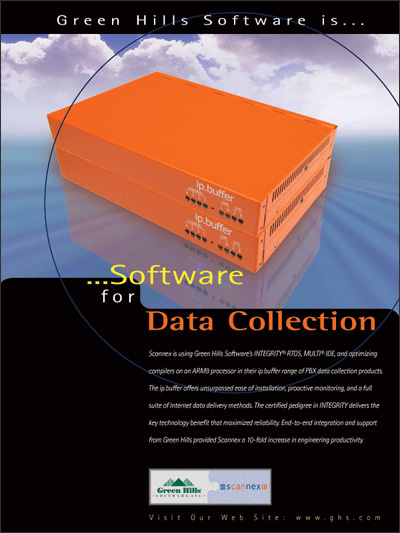 Scannex is using Green Hills Software’s INTEGRITY RTOS, MULTI IDE, and optimizing compilers on an ARM9 processor in their ip.buffer range of PBX data collection products. The ip.buffer offers unsurpassed ease of installation, proactive monitoring, and a full suite of Internet data delivery methods. The certified pedigree in INTEGRITY delivers the key technology benefit that maximized reliability. End-to-end integration and support from Green Hills provided Scannex a 10-fold increase in engineering productivity.